Collaboration is widely assumed to be a good thing in humanities research for many reasons. Collaboration between researchers, instead of the more familiar humanities ‘lone researcher’ model, is seen as a way of bringing various perspectives to the one problem; it is also an important form of mentoring. However, it is not clear how best to encourage and enable collaboration at the organizational level or how to handle some of the problems that arise in the course of collaboration – which may include strong differences of opinion about how to proceed with research as well as power differences between more experienced and junior researchers. Collaboration between university-based researchers and industry is also increasingly seen as a way of not only gaining research funding, but also demonstrating the relevance of humanities research to society. Again, however, this raises a series of issues and problems, as well as possibilities including: the different expectations of industry partners and academics; issues of privacy and confidentiality for industry partners and how these impact on academic research dissemination. 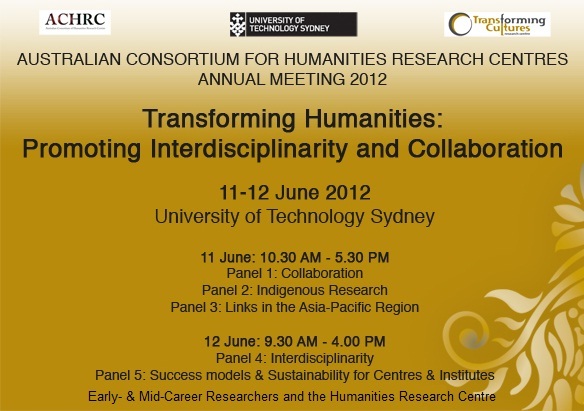 This panel explores the issues, concerns and creative possibilities raised by various kinds of research collaboration. Research has been highly problematic for many Indigenous peoples globally and this central theme of distrust resulting from its Eurocentric focus and its continuing close connection with colonisation. As Western Research objectified, oppressed, blamed and devalued Indigenous peoples, It also appropriated knowledges, exploited and misrepresented its subjects, informed prejudices and racism, as well as created power imbalances with benefit afforded only to the Academic experts. Indigenous researchers are attempting to counter this approach through the development of methods and praxis that celebrate the resilience, make visible the silenced, respect people and their cultural protocols and ensure benefit is an outcome of the change we are all collaboratively working towards (Smith 2005). This counter-approach requires that the Indigenous researcher be cognisant of Western ways of knowing, being and doing as well as decolonising themselves. For our first year, the ACHRC’s focus has been strongly on local Australian issues, but the humanities necessarily go beyond national borders. At this meeting, we plan to become officially Australasian, and the purpose of this panel is to begin to map what this might mean, especially in New Zealand and South-East Asia. 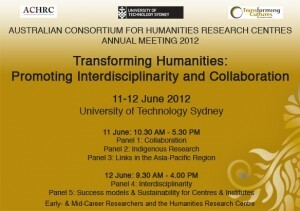 What are the networks and possibilities for collaboration for the humanities in the Asia Pacific? What presently exists, and what is possible? We hope, in a couple of years, to be a partner in a genuinely regional meeting of research centres that makes Australia’s claim to be ‘in Asia’ culturally salient. This is a first step in mapping that territory. So this panel addresses questions about organisational structures within and between nations, but it also addresses major questions about what the humanities should be outside the European and North American contexts. Interdisciplinarity has become a key concept in discussions of research, as well as of creativity, innovation, and problem-solving. Researchers are pressured to demonstrate their ability to work in an interdisciplinary way, even when research assessment exercises (such as ERA) are conducted by reference to disciplines. This panel explores the problems and possibilities opened up by the drive to interdisciplinarity, by reference to the experience of panel members, asking what modes and models of disciplinary interaction (multidisciplinary, interdisciplinary, transdisciplinary) have been the most effective and most useful. The impact of ERA in putting a value on quality research that may not need to generate a lot of grant income. We hope that this discussion will form the basis for a research project on the costs and benefits of research centres and institutes with the new DASSH group of Associate Deans (Research) and other organisations. ECR Afternoon Tea: Ready for a Kaffeeklatsch*? Join us for a conversation by early career researchers for early career researchers. You did it! Your hard work paid off and you were finally were lucky enough to get that humanities position at an Australian university. It is time to plan your career, but you are concerned about the future. You have the qualities, intellect and ambition to become a successful researcher producing work of the highest quality—if you are properly supported. Many early-career humanities researchers have no security and live off grants giving temporary respite. Others struggle to maintain an adequate commitment to teaching or balance academic pressures with family life while making the time necessary to continue first-class research. The ACHRC would like to know what we can do to assist early-career researchers in the humanities and we plan to programme for early-to-mid-career researchers more effectively in the coming years. So, please, join us in an informal afternoon tea conversation aimed at instigating networking and some ideas for early-to-mid-career researchers who are involved in researching in and around a Humanities Research Centre. We hope that this session will help establish some direction for that programming as well as provide an opportunity for EMCRs to network. What do Early-to-mid-Career Researchers want? What are some career paths for Early-to-mid-Career Researchers? What is the role of Humanities research centres in career development for Early-to-mid-Career Researchers ? What structural and infrastructural things can centres do to develop opportunities for Early-to-mid-Career Researchers? What steps can we undertake to see recognised the fact that achievements in most Humanities research projects takes much longer than the 3 years of a standard fixed term ECR position? *Note: a Kaffeeklatsch is an informal social gathering for conversation and coffee. The coffee is optional. There will be tea.